I’m one of those people that try to buy a lot of my LEGO sets on sale. 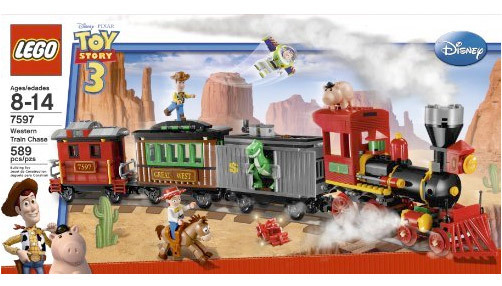 I think we are, for the next few months at least, past the heavy holiday-related clearances, but some Toy Story sets popped up on Amazon, including the LEGO Toy Story 3 7597 Western Train Chase for $55.76, which is about as cheap as I’ve seen it. I’ve seen the Trash Compactor Escape for around that price both in retail stores and online. The lowest I’ve seen the Western Train Chase was $59.99 at some Targets. I say it’s a clearance on the Train Chase set – if that’s not somebody clearing out Toy Story sets to make way for other Disney and/or Pixar lines that LEGO is pushing out in a few months, I don’t know what is. I’ve been tempted by it, but I’m putting my LEGO money into a few other sets that I want first. Brickset mentions that the Winter Village Bakery can be had at some LEGO retail stores for up to %30 off, so before buying on Amazon or elsewhere online, if you are interested in this set, try and make it to your local LEGO story if you are lucky enough to have one. Keep in mind that all of the above prices are subject to change, based on availability. I’ll try to make it to my local LEGO store this weekend and verify any sales/clearances, but my area is in for some very cold and nasty weather this week.